This is an undated narrative, written by Luticia "Tish" Lee, that describes the origins of a rolling pin that has become an heirloom of the Lee Family of Sanford, Florida. Lee wrote about this keepsake for which she had placed in her Love Cedar Chest, also known as a Hope Chest. While attending high school in 1940, Lee's parents gave her a hope chest, along with a bedspread crocheted by her mother. Also included inside was a rolling pin that her father, a member of the American Legion, had made from one of the wooden spokes from the wheel of a World War I-era cannon. The cannon was placed in front of American Legion Campbell-Lossing Post 53, located at 300 Seminole Boulevard, on January 17, 1936, but was dismantled for scrap metal during World War II. Lee married her husband James after the war on September 11, 1946. After her wedding, she began using the rolling pin. 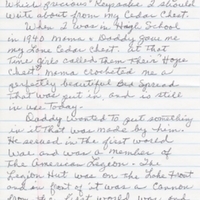 Original handwritten narrative by Luticia "Tish" Lee: Private Collection of Luticia "Tish" Lee. Digital reproduction of original handwritten narrative by Luticia "Tish" Lee. Creative Sanford, Inc., Sanford Welcome Center, Sanford Florida. Celery Soup: Florida’s Folk Life Play Collection, Sanford Collection, Seminole County Collection, RICHES of Central Florida. Originally created and owned by Luticia "Tish" Lee. Copyright to this resource is held by Luticia "Tish" Lee and is provided here by RICHES of Central Florida for educational purposes only. "American Legion Campbell-Lossing Post 53." American Legion Campbell-Lossing Post 53. http://www.americanlegionpost53florida.com/. "History." The American Legion. http://www.legion.org/history. American Legion. The American Legion. Indianapolis, Ind: American Legion, 1981. Lee, Luticia "Tish". “History of the Lee Family Rolling Pin.” RICHES of Central Florida accessed April 22, 2019, https://richesmi.cah.ucf.edu/omeka/items/show/3075.